Stockport County will be pleased to see the back of Brackley Town after a third encounter in two weeks produced another win for Kevin Wilkin’s side. 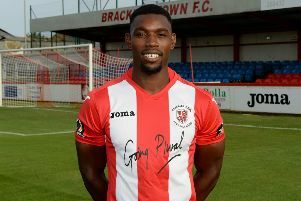 Top scorer Aaron Williams bagged his 27th goal of the season - the game’s only goal - as Saints won it late on in Saturday’s Vanarama National League North clash. On a difficult pitch at Edgeley Park, only passed playable after intensive efforts by ground staff and an inspection following heavy rain, both sets of players deserve immense credit for producing a pulsating and gripping match. These are the afternoons that explain why supporters follow this sport and follow their team because nothing can match the tension and the excitement generated in this fine win by Wilkin’s side. Stockport enjoyed the far greater possession in the first half with Saints coming more into the game only late on when fine work by Shepherd Murombedzi on the right delivered a cross that Jimmy Armson headed against the post in the nearest either side came to a goal. Glenn Walker’s low cross evaded everyone when just a touch was needed was Saints only other real moment of goal threat in a first half that County dominated for long periods, the corner count of ten to zero telling the story. Rhys Turner fired wide when well placed inside the area was County’s best effort. A more even second half again saw spells with the Hatters in the ascendency but unable to create too many clear cut chances to threaten Danny Lewis as resolute defending repelled County’s attacks. Lewis athletically pawed away a dangerous cross at the last and only excellent work by substitute Matt Lowe blocked Dan Cowan’s driving run and shot minutes later epitomising his side’s organisational strength and determined defending that kept the home side at bay. As in the first period, Saints found late forward impetus as Lowe’s running created openings. Armson shot at keeper Ben Hinchliffe after Lowe’s dribbling run. Two further chances were spurned as defenders cleared off the line with the goal at Saints’ mercy before Armson was again denied only by the woodwork. The crucial goal finally came in the 88th minute when Williams finished neatly from close range and five minutes of added-time were not enough for County to find a way back. On the final whistle both sets of players were spent, having given everything on a playing surface soft and sticky like treacle but it was celebration for Saints and bitter frustration for Stockport.